Preheat oven to 325 degrees f. Roast almonds 12 minutes and allow to cool while preparing pudding. After cooled, mince almonds in a food processor or use a knife. In a saucepan, combine cornstarch, salt and sugar. Add egg yolk to dry ingredients. Gradually stir in milk and continue stirring until well combined. Turn to medium heat and cook while stirring constantly. Continue cooking until a pudding like consistency. Remove from heat, stir in vanilla. 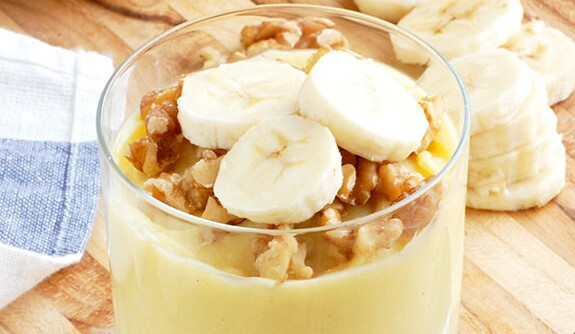 While still warm, alternate pudding with bananas in dessert dishes. Sprinkle minced almonds on top of pudding. Top with whipped topping if desired.